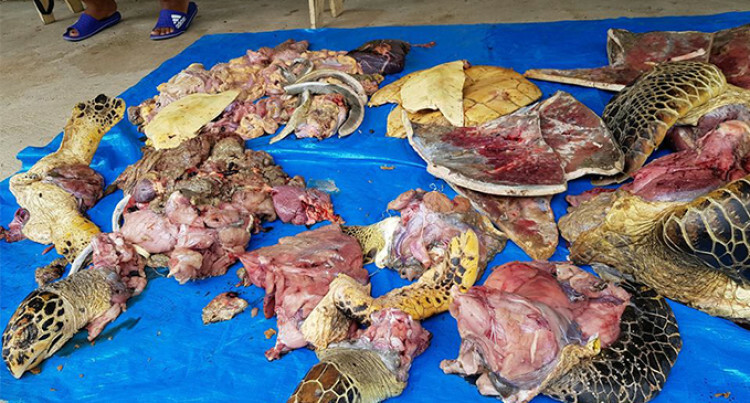 After an anonymous caller informed the Ministry of Fisheries officials based in Wainibokasi, the turtle meat was confiscated and those apprehended was taken in for police questioning. The Ministry of Fisheries is sending out a strong warning to people engaging in the harvesting, killing and selling of any sea turtles species and reminding everyone that the sea turtle ban is still in place. This comes after a confiscation of four slaughtered turtles weighing around 90 kilograms that was caught at the Naivakacau Landing in Tailevu yesterday morning which was on its way to the market. Permanent Secretary for Fisheries, Mr Craig Strong said that it is appalling that people have a total disregard for the law as the turtle ban has been well publicized. “People who are purchasing the turtle meat are just as guilty as they are the ones that are driving the demand for turtles,” said Mr Strong. Mr Strong added that the ministry will pursue all avenues to prosecute all involved. Ministry officials are also aware of the areas involved in turtle harvesting and is strongly requesting communities and villages to adhere to the ban in place. Public awareness and consultations have been carried out throughout the country and there should not be any excuse for illegal turtle harvesting, killing and selling. Under Regulation 5 of the Offshore Fisheries Management Regulations 2014 (OFMR), the provisions of the OFMR apply to “all Fiji Fisheries waters” so would apply in all internal, inshore and offshore areas of Fiji. These species constitute all the common species currently found in Fiji waters, and the restrictions apply to their eggs and/or any of their parts or products. The species of sea turtles found in Fiji are all listed internationally as vulnerable, endangered or critically endangered and therefore require careful management to ensure sustainability. • For individuals, an instant fine of $10,000, with the potential of up to $50,000 in fines. • For corporations, an instant fine of $20,000, with the potential of up to $100,000 in fines.